As a mom of three I know how much we worry as parents, whether it is our first or our last – the worry never ends. I had my first daughter, Abby, at 19 years of age and I know had there been this product on the market it would have been one I’d have bought. I remember many sleepless nights with Abby and not because she didn’t sleep, because I would stay up and watch over her. Fast forward to December 27, 2013 when I went into premature labor with our lovely little Bella, 6 weeks before her due date due to a concealed abruption that almost took both our lives. Our precious bundle was a tiny 4 lb girl who wasn’t breathing on her own, had no colour to her skin and needed immediate medical attention. She was placed on a CPAP and taken to a NICU in Toronto’s downtown core. She recovered quickly and stayed in NICU for 18 days, 18 of the longest days of my life! During her stay in the NICU they had monitors on her at all times, they ensured her breathing, heart rate and blood pressure was okay at all times. If something was to drop an alarm would go off to alert the nurses to her. As scary as those alarms are I can’t tell you how comforting it was to know that she was being constantly monitored. Leaving the hospital on that 18th day I wanted to take all of the machines home with me, she was still so very small and I was nervous. Even though she was my third my previous two were delivered with zero complications at full term, I had never had a preemie. When we got home with Bella I began co-sleeping as I couldn’t fathom putting this little tiny baby into a huge crib out of my sight. I needed to have her close to me so I could monitor her, feel her movements and hear her breathing. This worked fine for a while as she slept in a co-sleeper beside me but eventually she grew out of that and I then placed her on the bed beside me. That was okay too for a while until she started to roll around and become more mobile; I now worried about her somehow maneuvering around me and falling off the bed. It was time to cut that cord and put her in her crib! Bella transitioned nicely, me on the other hand I really had a hard time. I found myself constantly going down to the bedroom to check on her at all hours of the night. Mornings were no better as Bella is a really good sleeper and some days will sleep in as late as 10:00 am which the first few times made me nervous, why was my baby still sleeping at 9:00 am? I was exhausted, getting less sleep than I did when we slept together I needed something to ease my mind – and SLEEP! I was introduced to Snuza Go! 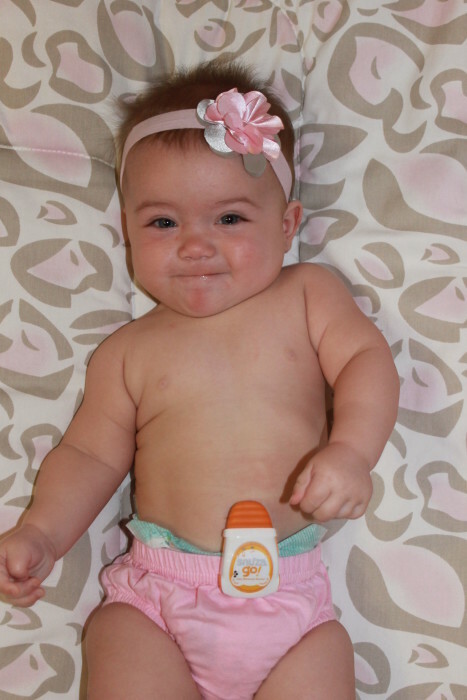 which is a small cordless and portable baby movement monitor that clips on to your baby’s diaper. It has a flexible tip which is ultra-sensitive to detect even the slightest of movements and if no movement is detected in a period of 20 seconds it will alert you via an audible alarm. You can adjust the settings to change the detection period from 20-seconds to 18 or 15. The Snuza Go! will also alert you if your baby’s movements are very weak or are less than 8 movements per minute! I like to use our Snuza Go! in conjunction with our sound monitor because my home is fairly large and if I am working in my office or doing a DIY project out in the garage I may not be able to hear the alarm so the sound monitor extends the distance by allowing me to hear the alarm through the monitor. Bella modeling her Snuza Go!, it isn’t easy getting her to stay still for photo’s nowadays – she LOVES eating her toes! What a cheeky monkey I have! As with all baby monitoring products the Snuza Go! may not be able to prevent the worst from happening but it gives me peace of mind Bella is being monitored without me losing sleep or running in the house every 10 minutes to check on my napping baby! You can purchase the Snuza Go! on Amazon.ca for $88 plus FREE Shipping! Enter below to win your very own Snuza Go! so you too can have peace of mind! Contest is open to Canada and USA and ends on September 1st, 2014. Please see the contest form below for Terms & Conditions and GOOD LUCK! Disclosure: I am part of the PTPA Brand Ambassador Program with Snuza and I received compensation as part of my affiliation with this group. The opinions on this blog are my own. My son was 4 weeks early and 5 pounds… I had him right next to me at all times. With my new baby though, I can’t sleep in he’s in the bed next to me because I want to make sure he’s okay. This would be perfect to ease my mind. And my favourite moment of bring both of the boys home, is snuggling with them on the couch for the very first time. Just smelling their new baby smell and wondering how everything goes so fast. What a cool product. I am a first time mom, due in March and I know something like this might really ease mind. My favorite moment was the first day he smiled back at me. My favorite memories bringing my first two babies home were those first co-sleeping/nursing snuggles in bed. There’s nothing like newbie snuggles! Baby is due in October so it will be an happy event for entire family to be able to enjoy him at same time. Those first few days, when the rest of the world seemed to stop. I miss those moments of perfection. When I brought my twin boys home, the other kids were so excited to meet them! I am still anxiously awaiting to being my newborn home. My daughter stopped breathing several times in the night, I would love to have this product for when we have another. Brilliant little item. My newborn spent a month in hospital so my favorite memory of bringing him home was just that -bringing him home and leavingthe hospital behind. Brilliant product! Now I’m considering this as a baby shower gift! scored one on amazon.ca…..can’t wait to give it to my friend!